The iconic 60s Australian rock-star - Steve Wright - has died. And I can't help but hum cheery Easybeats songs - which is I think the way it should be. Less well known is Bruce Springsteen's penchant for covering the Easybeats, however The Boss makes it an angry song and it shouldn't be like that. Today Valeant guided down its so-called cash EPS. You can find the press release at this link. The reduction is - at this end - $425 million on $3.25 billion of sales. The low end is thus a 13 percent revenue reduction. Here is what Valeant said about Philidor on the October 26 call. 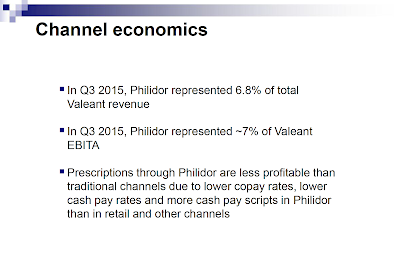 To quote: In Q3 2015, Philidor represented 6.8% of total Valeant revenue. 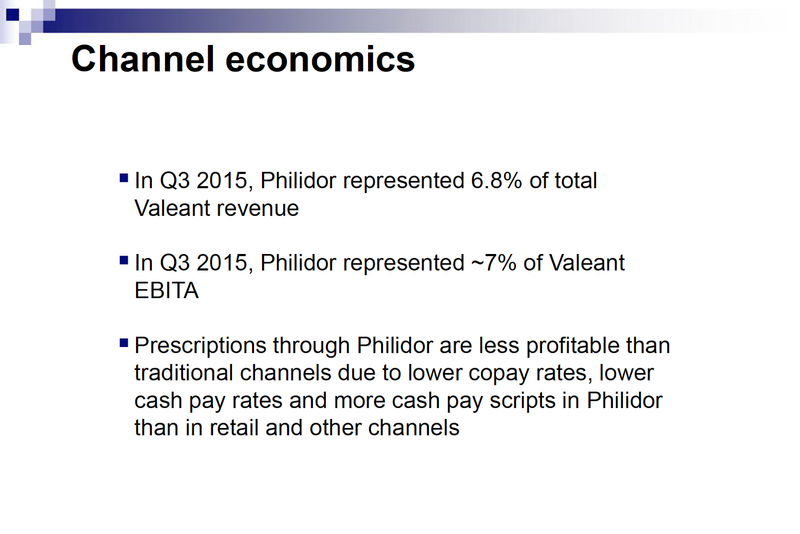 The reduction in revenue is about twice the revenue running through Philidor. Observation 1: The revenue drop is more than just Philidor. Something else is going on. The bull argument to date is that Philidor is a small percentage of sales some of which will be caught elsewhere and thus can be ignored. However the drop in sales is twice Philidor (or more than twice Philidor for most points in the range). Second - the "adjusted EPS* drops from $4.00 - $4.20 to $2.55 -$2.65. This is a drop at the minimum end of $4.00 to $2.65 0r $1.35 per share. There were - according to the last 10Q - 343,101,797 shares outstanding as of October 19, 2015. So so-called cash EPS will fall by roughly $463 million at a minimum. The fall in cash-EPS is more than double the entire revenue of Philidor. Again something other than Philidor has been broken here. Valeant tells the market about "cash EPS" - a measure that differs considerably from GAAP EPS. The cash EPS numbers are not audited. The differences are differences you must trust the management to honestly report. Here is the P&L statement for the last quarter and nine months from the 10-Q. Net income attributable to Valeant Pharmaceuticals International, Inc. Note that operating income (earnings before interest and tax) for the third quarter was $447.8 million and for the nine months was $1332.7 million. Note that the minimum fall in so-called "cash eps" in the fourth quarter is larger than the entirety of operating income in the third quarter. This should provide some scale. Here is the cash flow statement from the last 10-Q. Depreciation and amortization, including impairments of finite-lived intangible assets was $726.4 million in the third quarter and $1,768.4 for the nine months. In the third quarter EBITDA (defined as earnings before interest and tax and adding in depreciation and amortisation) was $447.8 + $726.4 million = $1174 million. This means that the run-rate GAAP EBITDA is $711 million or less. Here is a debt indenture. This debt indenture places restrictions on Valeant if the debt to EBITDA ratio exceed 3.5 times. These do not cause an "event of default" but do limit Valeant's flexibility to buy back shares (they can't), incur most indebtedness or to make other investments. Given that debt is about $30 billion and EBITDA run-rate is about $700 million per quarter there can be little question that Valeant is operating under strict loan-covenant based restrictions. Mike Pearson did not tell us about Philidor. Originally Valeant stated that they did not disclose Philidor because their alternative fulfilment was a "competitive advantage". Later they declared that Philidor was not unusual - other companies used specialty pharmacies (p. 8). Then Mike Pearson told us that the issues related to Philidor and Philidor was 6.8 percent of revenue. Then he guided down revenue by approximately double the sales of Philidor. Then he neglected to tell the market he was operating under covenants that restrict many of his actions. In October Bill Ackman thought that Valeant might buy-back stock at these low prices. That is not possible. Still despite these things it is clear that most the market believes something akin to Valeant's so-called cash EPS. The market trusts Mr Pearson for the moment. I am a gnarly fellow however: I note the revenue fall is roughly twice Philidor - so I know that I don't know what is going on and I don't believe what I am told. What you believe dear readers however is up to you.